Britney Spears had a big scare on Wednesday night when an audience member rushed the stage at her Las Vegas show. The incident was caught on videos that circulated on social media. 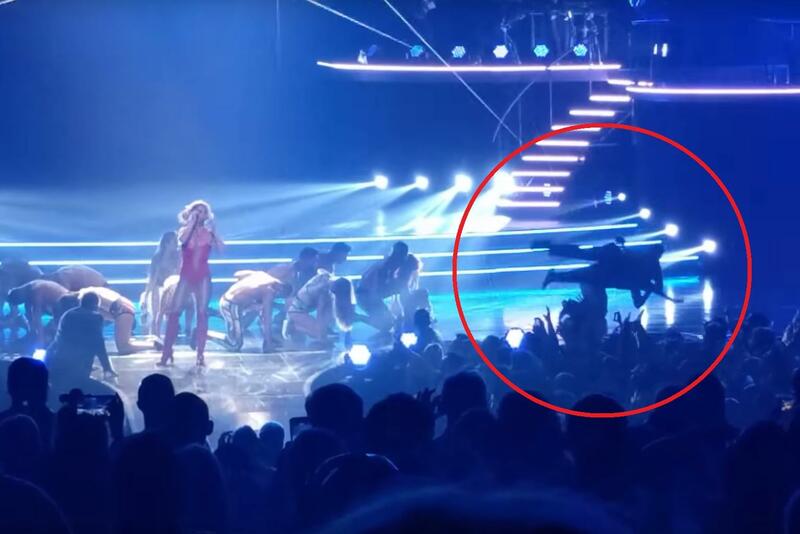 In a video, Spears does not notice at first that a man is getting slammed to the floor by security guards behind her on stage. When she realizes, the singer is visibly shaken as she turns and says into her microphone, "What's going on? ... Oh no!" to a guard. Then, Spears walks off stage with security. Michael Banks caught the incident on video and posted it on YouTube, which you can watch in the video player above or at this link. ET reports that police arrested 37-year-old Jesse Webb for trespassing, who was transported to the Clark County Detention Center. Webb was asked to leave the concert by security prior to him jumping on stage and dancing. Spears was singing "You Drive Me Crazy" when Webb jumped onstage. But the show went on after Spears returned to the stage. Her Piece of Me residency in Las Vegas, which began in 2013, will close in December. Spears showed fans she was excited before the show, tweeting, "Feels so good to be back in Vegas!!"